Dimples has been doing some Dinosaur Activities at preschool so I thought I would extend on this at home. He has always loved dinosaurs and we have done Dino fossils before but this time I tried to make them more realistic so he can link the fun he has had preschool to the fun he has with his dinosaurs at home. It was a success, they turned out much better and looked real! My little master Chef helped mix up a batch of Salt Dough, see the directions below. To make them look as realistic as possible we added some black food colouring, so that they looked like real rock fossils. It worked well, they turned into a dark grey rock colour. We made some extra fossils so he could give them to his preschool group and we did a little palaeontology digging with his favourite ones. They were so easy to make and Dimples loved pressing his dino toys into the dough and inspecting how they looked, he looked closely at the details and did a few experiments with some foot prints before deciding which ones worked best. Mix together salt and flour, gradually add the hot water. If you want to add tempura paint or food colouring to your fossils add it into the water first. Mix into a dough consistency and then knead the dough for 5 minutes until smooth. Divide the dough into small rock shapes, make them roughly the same thickness and size so that they bake evenly. Gather some toys that can be pressed in to form your fossils (plastic animals & dinosaurs feet and body parts work well). 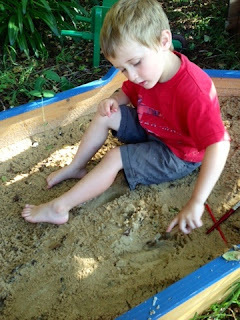 We had some skeleton Dinosaurs which worked perfectly and some plastic dinosaurs with realistic feet shapes. The salt dough can be air dried but for a better quicker result bake it slowly on low heat until rock hard. We baked them on 120 degrees for an hour and a half but this depends on the size of your fossils. You can double check if they are dried properly by inspecting the bottom, it should be hard and evenly cooked all over without the 'dough' look. Once they're cooled off they can be painted and decorated or left as is. Bury them in a sand box to be “discovered” (if you have a large sand box you could put a small flag above where they are buried). 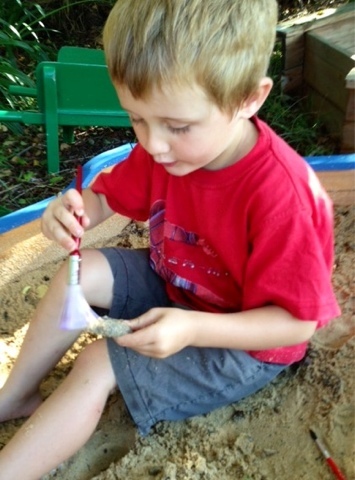 Then provide your pre-schooler with a small spade, pick and some paint brushes. Once they find it, they can un-cover it and brush the sand off. You can ask them to be very careful not to break or damage the fossil and get them to brush around them as a real palaeontologist would. The discovered fossils can then be added to small world play and put on display. 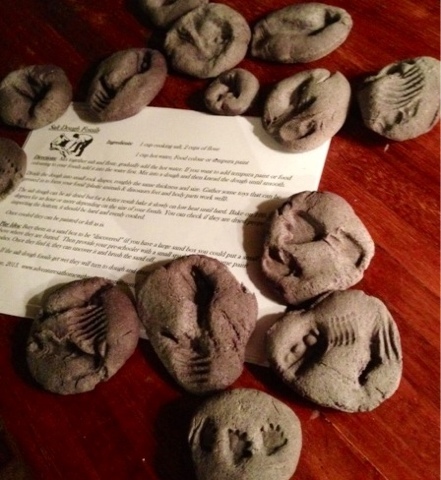 Note: If the salt dough fossils get wet they will turn back to dough and crumble away. What a great way to get kids learning about dinosaurs and playing archaeology! I was going to say the same thing. They turned out really wonderfully. Also, where did you buy the black food colouring? I've been looking all over but can't find any other than the gel stuff. I really like dinosaur activities and this is a really cool one, I've tried a similar one with my students and it was a huge success. That being said, I have to correct you on one thing. Dinosaurs aren't studied by archaeologists but by paleontologists. So this isn't "archeologist play" but "paleontologist play". I am sorry, I don't mean to be obnoxious or rude but I see people confusing these two sciences all the time and it really get in my nervs (its a pet peeve of mine). I saw these on Pinterest and pinned straight away...they look so realistic! What a fab learning activity! What a fun activity! Thanks for linking up to Mom's Library! They do look realistic! My Dino Boy just said, 'wow', looks like little dinosaurs!